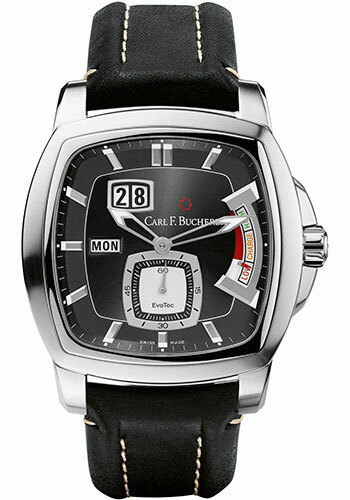 43.75 x 44.5 mm stainless steel case, 13.95 mm thick, sapphire crystal back, screw down crown, sapphire crystal with anti-reflective coating on both sides, black dial, Caliber CFB A1002 automatic movement with big date, day of the week, hour, minute, small seconds and power reserve, approximately 55 h of power reserve, black calfskin strap, folding buckle with stainless steel clasp. Water resistant to 50 m.
43.75 x 44.5 mm stainless steel case, 13.95 mm thick, sapphire crystal back, screw down crown in rubber, rubber bezel, sapphire crystal with anti-reflective coating on both sides, black dial, Caliber CFB A1002 automatic movement with big date, day of the week, hour, minute, small seconds and power reserve, approximately 55 h of power reserve, stainless steel bracelet, folding buckle. Water resistant to 50 m.
43.75 x 44.5 mm stainless steel case, 13.95 mm thick, sapphire crystal back, screw down crown, sapphire crystal with anti-reflective coating on both sides, rhodium dial, Caliber CFB A1002 automatic movement with big date, day of the week, hour, minute, small seconds and power reserve, approximately 55 h of power reserve, brown calfskin strap, folding buckle. Water resistant to 50 m.
43.75 x 44.5 mm stainless steel case, 13.95 mm thick, sapphire crystal back, sapphire crystal with anti-reflective coating on both sides, rhodium dial, Caliber CFB A1002 automatic movement with big date, day of the week, hour, minute, small seconds and power reserve, approximately 55 h of power reserve, stainless steel bracelet, folding buckle. Water resistant to 50 m.
43.75 x 44.5 mm stainless steel case, 13.95 mm thick, sapphire crystal back, screw down crown, rubber bezel, sapphire crystal with anti-reflective coating on both sides, black dial, Caliber CFB A1002 automatic movement with big date, day of the week, hour, minute, small seconds and power reserve, approximately 55 h of power reserve, black calfskin strap, folding buckle. Water resistant to 50 m.